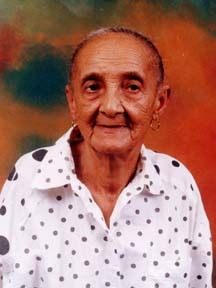 Yudi Rodriguez's grandmother died a short time before Yudi and her mother had a chance to see her. On Monday December 2nd we received a phone call early in the morning from my family in the Dominican Republic. I was still in bed when I heard my mom crying. I had no idea why my mom was crying. She gave me the phone. It was my uncle Amador. He told me that my grandmother was ill and she was taken to the hospital. My sister and I started crying hoping that she would get better. That morning my mom and I headed up to my school to ask permission so I could leave the country for a few days and not lose my credits. After that we started calling airlines so we could get a ticket as soon as possible. We got one that would depart at 7:00 a. m. the next day to arrive in the Dominican Republic at 2:00 p. m.
Then we began calling Santo Domingo to see how my grandmother was doing. We were encouraged when my family said that when she got better they would let us talk to her. The next day we got on our plane and left for Santo Domingo. Through the whole trip my mom and I were making so many plans about how to help my grandmother. We talked about how she would react when we arrived at our house and what she might say about coming to the U. S. A. We thought she would be surprised about me since she had not seem for a year and six months. We were full of dreams that we wanted to make true. Although we were joking together, our hearts and minds were with my grandmother. Finally the pilot announced that we were about to arrive in the Dominican Republic. After we picked up our luggage we met our neighbor who was waiting for us to take us home. He told us that my grandmother was better and that was released from the hospital. My mom and I felt so happy that I asked my mom to stop so we could buy something to eat because we had more than one day without eating. My mom didn’t want to because she wanted to go home and see her mother. But the gentlemen who picked us up at the airport was insisting for us to get something to eat. After we ate we headed up to the house. My heart was beating like it was going to burst. When we got home, I just remember that there were a lot of people in my house, in the patio, the street, maybe a hundred people or more. At that moment we realized that my grandmother was dead. I don’t remember who took us out of the car. I just remember that I was crying and my mom, too. Then the people that were there took us to the porch and my body was shaking. After a couple hours, when my mom and I were a little calmer, our family started telling us how things happened with my grandmother. My cousin Josefina, who was taking care of my grandmother, told us that the doctors said that my grandmother was better and that they were going to release her after they made a few check-ups on her. But around 2:00 a. m. she had two heart attacks in sequence and the second one killed her.